American engineer mission specialist astronaut 1990-2003. Engineer. Status: Inactive; Active 1990-2003. Born: 1958-05-10. Spaceflights: 4 . Total time in space: 40.82 days. Birth Place: Los Angeles, California. Grew up in La Mesa, California. Educated San Diego State; Stanford. Born May 10, 1958 in Los Angeles, California, but considers La Mesa, California, to be her hometown. Married to Coe Fulmer Miles of Molalla, Oregon. She is a classical flutist and private pilot, and also enjoys volleyball and bicycling. Her mother, Rosanne Ochoa, resides in La Mesa. His parents, Louis and Georgia Zak, reside in Waldport, Oregon. Graduated from Grossmont High School, La Mesa, California, in 1975; received a bachelor of science degree in physics from San Diego State University in 1980, a master of science degree and doctorate in electrical engineering from Stanford University in 1981 and 1985, respectively. Member of the Optical Society of America (OSA), the American Institute of Aeronautics and Astronautics (AIAA), Phi Beta Kappa and Sigma Xi honor societies. Valedictorian of San Diego State University. Recipient of Stanford Engineering Fellowship and IBM Predoctoral Fellowship. Hispanic Magazine Science Achievement Award. Congressional Hispanic Caucus Medallion of Excellence. Women in Science & Engineering (WISE) Engineering Achievement Award. San Diego State University Alumna of the Year. Hispanic Heritage Leadership Award. NASA Outstanding Leadership Award. Mortar Board National Citation. Albert Baez Award for Outstanding Technical Contribution to Humanity. As a doctoral student at Stanford, and later as a researcher at Sandia National Laboratories and NASA Ames Research Center, Dr. Ochoa investigated optical systems for performing information processing. She is a co-inventor on three patents for an optical inspection system, an optical object recognition method, and a method for noise removal in images. As Chief if the Intelligent Systems Technology Branch at Ames, she supervised 35 engineers and scientists in the research and development of computational systems for aerospace missions. Dr. Ochoa has presented numerous papers at technical conferences and in scientific journals. 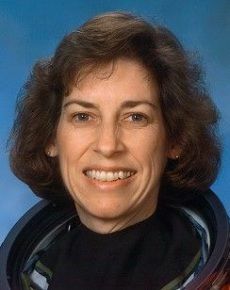 Selected by NASA in January 1990, Dr. Ochoa became an astronaut in July 1991. Her technical assignments to date include flight software verification in the Shuttle Avionics Integration Laboratory, crew representative for flight software and computer hardware development, and crew representative for robotics development, testing, and training. A veteran of two space flights, Dr. Ochoa has logged over 484 hours in space. Since returning from STS-66, she has been working on the International Space Station program. She is currently the Assistant for Station to the Chief of the Astronaut Office, directing crew involvement in the development and operation of the Station.. In April 1993, Dr. Ochoa flew as a Mission Specialist on STS-56, carrying ATLAS-2. During this 9-day mission the crew of Discovery conducted atmospheric and solar studies in order to better understand the effect of solar activity on the Earth's climate and environment. Dr. Ochoa used the Remote Manipulator System (RMS) to deploy and capture the Spartan satellite, which studied the solar corona. Dr. Ochoa was the Payload Commander on the STS-66 Atmospheric Laboratory for Applications and Science-3 mission (November 3-14, 1994). ATLAS-3 continues the series of Spacelab flights to study the energy of the Sun during an 11-year solar cycle and to learn how changes in the sun's irradiance affect the Earth's climate and environment. Dr. Ochoa used the RMS to retrieve the CRISTA-SPAS atmospheric research satellite at the end of its 8-day free flight. Family: Astronaut. Country: USA. Spacecraft: ISS. Flights: STS-56, STS-66, STS-96, STS-110. Projects: STS. Bibliography: 12, 5846. 1958 May 10 - . Birth of Dr Ellen Lauri Ochoa - . Nation: USA. Related Persons: Ochoa. American engineer mission specialist astronaut 1990-2003. Engineer. 4 spaceflights, 40.8 days in space. Flew to orbit on STS-56 (1993), STS-66, STS-96, STS-110..
1990 January 17 - . NASA Astronaut Training Group 13 selected. - . Nation: USA. Related Persons: Bursch, Chiao, Clifford, Cockrell, Collins, Eileen, Currie, Gregory, William, Halsell, Harris, Helms, Jones, McArthur, Newman, Ochoa, Precourt, Searfoss, Sega, Thomas, Voss, Janice, Walz, Wilcutt, Wisoff, Wolf. Mission Specialists: Bachelor's degree in engineering, biological science, physical science or mathematics and minimum three years of related experience or an advanced degree. Vision minimum 20/150 uncorrected, correctable to 20/20. Maximum sitting blood pressure of 140/90. Height between 150 and 193 cm.. Reported to the Johnson Space Center in late July 1990 to begin their year long training. Chosen from 1945 qualified applicants, then 106 finalists screened between September and November 1989. 1993 April 17 - . Landing of STS-56 - . Return Crew: Cameron, Cockrell, Foale, Ochoa, Oswald. Nation: USA. Related Persons: Cameron, Cockrell, Foale, Ochoa, Oswald. Program: Spacelab. Flight: STS-56. STS-56 landed at 11:40 GMT. .
1999 May 27 - . STS-96 Mission Status Report # 02 - . Nation: USA. Related Persons: Barry, Husband, Jernigan, Ochoa, Payette, Rominger, Tokarev. Program: ISS. Flight: STS-96. STS-96 Mission Status Report # 01 - . Nation: USA. Related Persons: Barry, Husband, Jernigan, Ochoa, Payette, Rominger, Tokarev. Program: ISS. Flight: STS-96. 1999 May 28 - . STS-96 Mission Status Report # 03 - . Nation: USA. Related Persons: Barry, Husband, Jernigan, Ochoa, Payette, Rominger, Tokarev. Program: ISS. Flight: STS-96. STS-96 Mission Status Report # 04 - . Nation: USA. Related Persons: Barry, Husband, Jernigan, Ochoa, Payette, Rominger. Program: ISS. Flight: STS-96. 1999 May 29 - . STS-96 Mission Status Report # 06 - . Nation: USA. Related Persons: Barry, Husband, Jernigan, Ochoa, Payette, Rominger, Tokarev. Program: ISS. Flight: STS-96. STS-96 Mission Status Report # 07 - . Nation: USA. Related Persons: Barry, Jernigan, Ochoa, Payette. Program: ISS. Flight: STS-96. 1999 May 30 - . 1999 May 31 - . 1999 June 1 - . STS-96 Mission Status Report #12 - . Nation: USA. Related Persons: Barry, Ochoa, Payette, Rominger, Tokarev. Program: ISS. Flight: STS-96. 1999 June 2 - . STS-96 Mission Status Report #15 - . Nation: USA. Related Persons: Husband, Ochoa, Payette, Rominger, Tokarev. Program: ISS. Flight: STS-96. 1999 June 4 - . 1999 June 5 - . 1999 June 6 - . Landing of STS-96 - . Return Crew: Barry, Husband, Jernigan, Ochoa, Payette, Rominger, Tokarev. Nation: USA. Related Persons: Barry, Husband, Jernigan, Ochoa, Payette, Rominger, Tokarev. Program: ISS. Flight: STS-96. STS-96 landed at 06:02 GMT. .